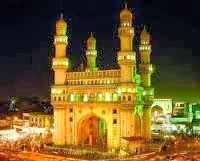 The Charminar, built in 1591 AD, is as much the signature of Hyderabad as the Taj Mahal is of Agra or the Eiffel Tower is of Paris. The English name is a transliteration and combination of the Urdu words Char and Minar, translating to "Four Towers"; the eponymous towers are ornate minarets attached and supported by four grand arches. The landmark has become a global icon of Hyderabad, listed among the most recognized structures of India. The Charminar is on the east bank of Musi river. To the northeast lies the Laad Bazaar and in the west end lies the granite-made richly ornamented Makkah Masjid.